The fourth and final winner of Digicel’s “Top Up & Win Mega Cash” promotion was drawn live on TVWAN at 5:35pm on Monday 15 February. 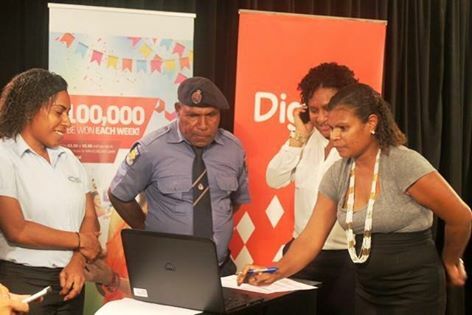 James Atameng from Lae was thrilled to be one in 10 random Digicel customers to answer his phone and be the lucky final winner of this life-changing competition. James resides in Lae and is a regular customer of Digicel and like many other enthusiastic customers purchased the unique flex cards to enter the competition. James was overjoyed to be the last winner of the K100,000 major cash prize. Digicel’s Head of Consumer Khattar Fehmi said he was pleased that Digicel has rewarded another customer with a fantastic prize. “We value our customers and their continued loyalty and have enjoyed rewarding four deserving customers with K100,000 each since January,” he said. The Top Up & Win Mega Cash promotion, which ended last night was launched in January and ran every Monday evening at 5:35pm from January 25 until February 15.